Cajun Cafe Bourbon Chicken emulates the bourbon chicken that appears to frequently in shopping malls. 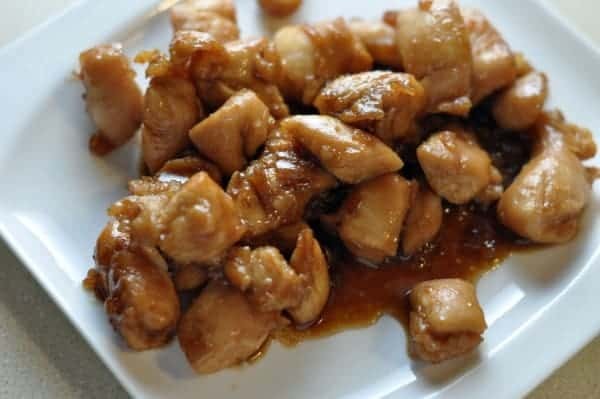 Cajun Cafe Bourbon Chicken is a wonderful easy to make chicken dish, best of all you can make the Cajun Cafe Bourbon Chicken with chicken breasts, it’s really easy to make Cajun Cafe Bourbon Chicken. Very Tasty and spicy dish ,i made it many times in my home and enjoy with my family they also loved it & Main part of this dishes is how to make the sauce.Sauce gives the flavor of this dish .For good smell you must use sesame oil And for spicy you can use hot sauce and red chili . Thanks for sharing. DON’T WASTE YOUR TIME OR MONEY MAKING THIS RECIPE..100000% WASTE OF MY TIME AND MONEY. IT IS NOTHING LIKE KELLY’S CAJUN GRILL BURBON CHICKEN. THE “SAUCE” LOOKS LIKE CHICKEN BROTH, NOT DARK IN COLOR AT ALL. DOESN’T TASTE LIKE KELLY’S CAJUN GRILL AT ALL. I am very sorry you didn’t think the recipe tastes like Kelly’s Cajun Grill at all. I was trying to emulate Cajun Cafe Bourbon chicken, which was a different place. I was excited about trying this, but then after seeing the reviews I was hesitant. I went ahead and made it, and I’m glad I did. The flavor itself was good, and a pretty close match. The sauce is very thin, so I tried reducing it to make it thicker. It was still pretty watery, even after cooking about half the liquid off, but it tasted good, and my very picky eater loved it. Ok what did I do wrong? I followed the directions to the letter. Not a lot of flavor and the sauce was very light in color and like water. I was expecting the sauce to be darker and a little thicker. It did not stay on the rice. Lots of excellent reviews. Must be me. Help! 20 Pounds of chicken thighs with skins on. it. It’s really the key to making this recipe like the Mall. a spoon. Marinade chicken in sauce for 12 hours at least (refrigerate of course). which is good because it is too strong (in my opinion) if you just eat it. the sauce including those skins). Sauce should be thin (add a little water if necessary). Reheat everything in a pan, let sauce reduce to desired thickness, serve hot. I also throw some steamed broccoli in for color at the end. Thanks Glenn, I appreciate your recipe I can’t wait to give it a try. You have a great recipe. I think quite possibly this was the worst dish I ever made. I only wished I would’ve read the comments. At least I have bourbon for dinner! This was the WORST recipe I have ever made! Sunday is my only day that my family eats together….and I have left the dinner table long enough to throw this food out…and go get a carry out pizza! Don’t waste your time or money making this recipe! give us the recipe then. Please do give us the recipe! I would love to have the recipe for this delicious chicken. What is the secret?????? I just tried this recipe. It is a BIG disappointment! This is nothing like the Bourbon Chicken at the Cajun Cafe, or any other mall food stand. The sauce was water thin, no sweetness to it, and had no smell like the mall chicken. I followed the recipe exactly, adding vanilla intead of bourbon like other recipes have directed, including one commenter on this site. Will not make this recipe again, but still trying to find that magic combination that will emulate the real thing! Mix well to dissolve sugar and marinade thighs overnight. Grill or cook on griddle. Heat the marinade and thicken w cornstarch slurry. Serve w thickened sauce and enjoy! I am sorry yours didn’t turn out. My picture was that of the recipe. Maybe if you would have reduced the sauce we would have had something that looked a little closer. TRY ADDING SOME LIQUID HICKORY SMOKE JUST A LITTLE TO GIVE IT THAT SMOKEY FLAVOR. Lame recipe, nothing like Cajun Cafe….So disappointing…. The mall or fair version adds vanilla extract and does not add any real bourbon at all. When you buy this at the mall, is it really made with bourbon or do they have another mix of ingredients that omits the whisky? Personally, I think they may add some flavoring, or they add so little, the bourbon is most likely the most expensive ingredient in the dish. This sounds good.. but I don’t see any ingredient that makes it hot?? You could add between 1/2 to 1 teaspoon of red pepper flakes to give this heat.